This 80-mile bicycle tour in the Lakes Region of the Adirondacks in New York State follows a varying terrain, often relatively flat but including some good climbs as it skirts south of the High Peaks region. Our ride heads west from North Creek, NY on Route 28, which has a wide shoulder and is marked as a NY state cycling route, We start out following the headwaters of the Hudson River, but After about 6 miles we begin climbing and pulling away. It is in this section of the Hudson that kayakers find some of the most challenging gorges in the eastern United States. 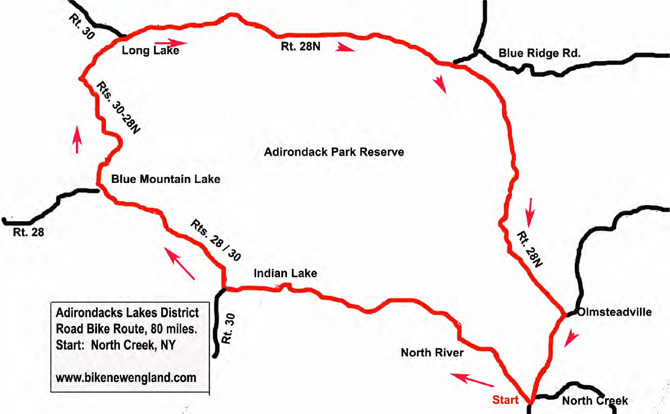 After 14 miles we begin a descent to Indian Lake, which has the first of several nice NY state campgrounds. The Indian River flows from here into the Hudson, offering more outstanding whitewater kayaking. At about the 28 mile pointing our ride we enter the town of Blue Mountain Lake, which is where Route 30 and 28N head west and Rt. 28 goes south. The town is a good place for stopping to enjoy the hike up Blue Mountain and to check out the Adirondack chairs made by local craftsmen as well as a visit to the Adirondack Museum. We have often camped a few miles south on Racquette Lake, but the paved shoulder will be only about a foot wide on some sections. Our route today continues from Blue Mt Lake on Rt. 28N/30 north to Long Lake, where Rt. 30 turns west and we head east on Rt. 28N. The paved shoulder for cycling continues, although not quite as wide. There will be few places to stop in this rather remote area as we continue on to Newcomb at mile 54, where we recommend a stop for refreshments. A steep descent past Calahan Lake on the right brings you to Minerva at mile 72. Although the paved shoulder here is fairly wide, use caution. You will soon be back to the starting point in North Creek. 55.3 Lake Harris Campground and Day-Use Area is on the left. 79.7 Right turn, Main St.
Come ride with us and help change a life! Tour the beautiful bucolic slate valley of western Vermont and bordering NY. All net proceeds will be donated to Teen Challenge, Vt. in their continuing effort to help change lives from addiction. To register and more info visit: www.tourdeslate.org. 10th Annual Cycle the Seacoast, Portsmouth NH: May 5, 2019 - Choose from 25, 50 or 100 mile route options along the historic seacoast of New Hampshire on the first Sunday of May! Starting and ending at Cisco Brewers Portsmouth, there's something for everyone! All levels and abilities are welcome! Tour de Minnechaug Mountain, May 5th, 2019 - Ride 8, 20 or 40 miles through the historic countryside of the New England towns of Wilbraham and Hampden. All net proceeds benefit the youth development projects of the Rotary Club of Wilbraham-Hampden. Trek Across Maine: June 14-16, 2019 - New route, same great ride! The 35th annual Trek Across Maine is on Father's Day Weekend - June 14 – 16th, 2019. 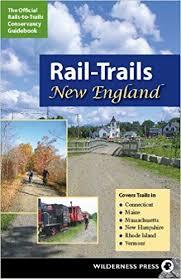 Featuring a new route for our 35th Anniversary, cycle 180 miles across the state of Maine.